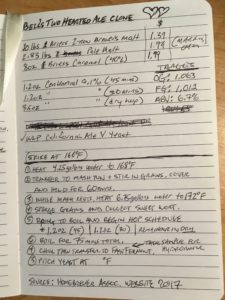 Recently, I was reading a good friend’s beer blog, where he pondered the meaning of seasonal beers, and it helped light a fire under me to start brewing now when the conditions are good, in order to have beer in the winter when it can be a little more challenging to brew ales — which require warmer temperatures to ferment. Inspiration also found me in the form of “mor beer plz” written on the chalkboard handles of the (empty) beer taps in our kitchen. There was also a sad face emoticon (not pictured). 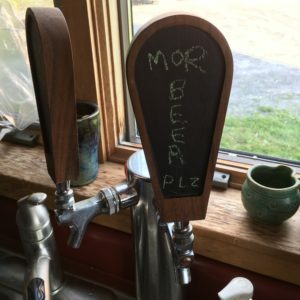 To be fair, Sarah didn’t just drop … subtle … hints, she was a partner in this brew from start to finish. We completed the brew in record time, and she was able to go to her fiber spinning group’s monthly gathering on time. There were ❤️❤️ making this brew, and we had much fun brewing it together. 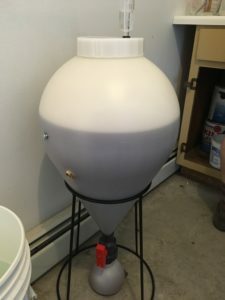 It was also exciting because it was our trial run with the FastFerment system I was given as a gift last year. The try-out was overdue. Hopefully there will be a review of the product after we have had a chance to sample the finished beer. Bell’s Two Hearted Ale is a favorite in our household, and was even recently named the ‘Best Beer in America‘ by Zymurgy. The name of the beer comes via the Two Hearted River in Michigan, so ours is going by Second Branch Ale after the tributary of the White River that runs close to our property. 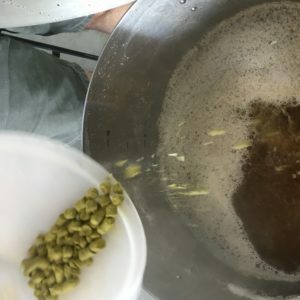 This recipe is based closely on one published by the American Homebrewers Association. And one of the things that’s great about it, is it isn’t a complicated recipe. It is practically a SMaSH. • Heat 4.25 gallons (based on pounds of grain multiplied by 1.3) to ~168ºF attempting to strike at 166ºF. • Transfer heated water to mash tun and stir in the grains. • Cover the mash tun and let rest for 60 minutes. • Sparge (we used fly method) the grains using 6.75 gallons (based on pounds of grain multiplied by 2) water at ~170ºF. • Collect the wort and bring to boil. • Add hops as scheduled above. 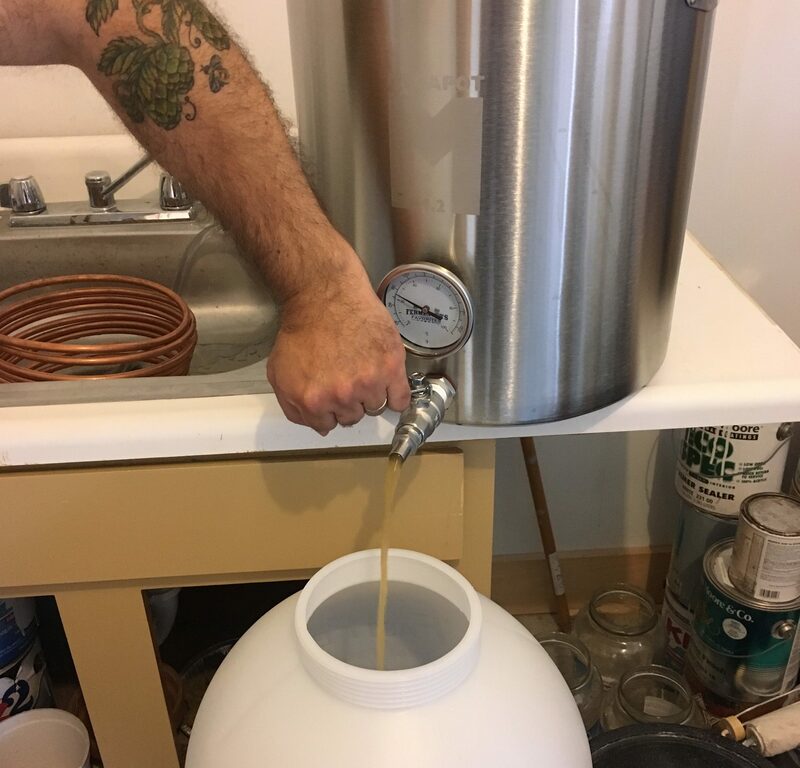 • Chill wort and transfer to FastFerment unit. • Pitch yeast. Ours was at approximately 78ºF at this time. The plan is to remove and empty the collection ball from the FastFerment unit a week from today, and then add the remaining Centennial hops. After that, remove and empty the collection ball each week until the beer is clear. At which time it will be transferred to a keg and chilled for consumption. We made two small changes to the original, including substituting Marris Otter for the Briess Pale Malt because we had some on hand. 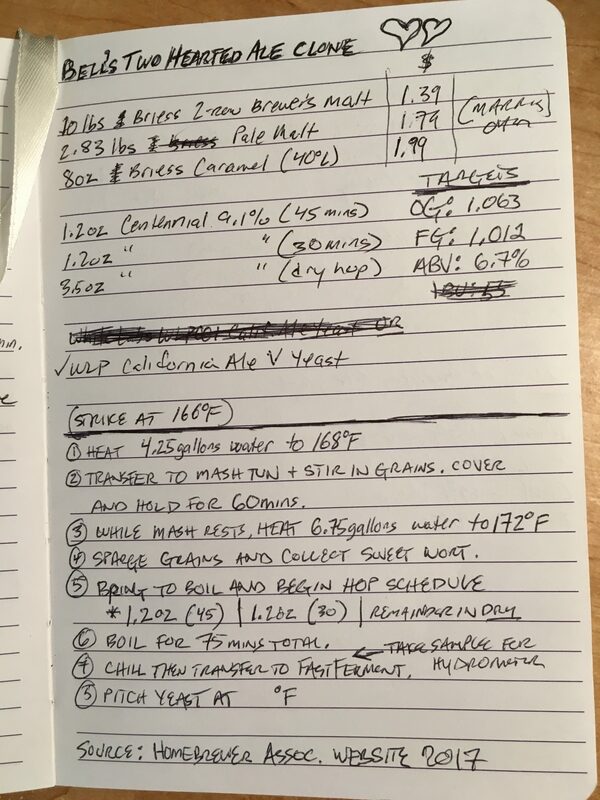 The recipe called for Centennial hops at 9.1%, and we mixed and matched AAUs of 10.1% & 7.0% to find a close facsimile. We also plan to use whatever amount of Centennial by weight we still have when it is time to dry-hop. Waste not, want not.